It's graduation time, maybe this is found at dorm railings after finals. "Never get so drunk and lean or hurl over railing." Good advice for those below to know as well. You better hope you are near a trash can fire and ONLY a trash can fire. Otherwise you are toast. Literally. I think this is a storyboard from The Day The Earth Stood Still. (YES, the original. Please.) 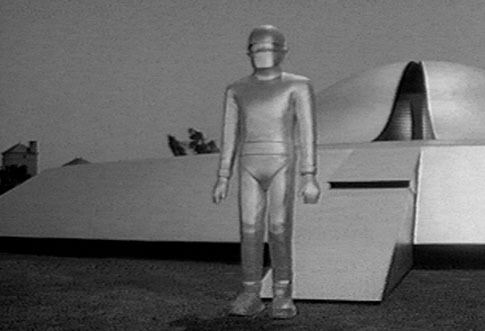 It shows Gort in an early training mission for his journey to earth. The training isn't going so well. Klaatu barada nikto, John S! This one is a personal favorite, sent in by Shana. I LOVE that they put stars to indicate his head getting hit. Love that. What the hell kind of comic book arch villain chemicals are they using up in Canada? Not only is this guy's hand gone, but he's some kind of two-face mutant as well! Sarah found this and I keep hearing "Light as a feather, stiff as a board" in my brain. Cuz there is no way these guys can seriously lift this box with their skinny arms.